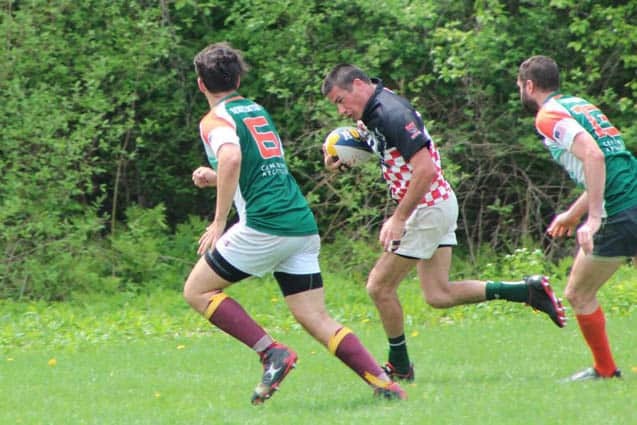 On a hot and humid Saturday morning, May 16, Rutland traveled down to play a friendly match against local rivals, Bennington Battle RFC. Throughout the short game, the sides remained evenly matched, despite the fact that the scrimmage saw many players bow out to injury. Rutland Team Captain Peter “Pepsi” Dayton scored a hat-trick, which was complemented by tries from TJ Moran and “Wild” Bill Temple. The score at the final whistle stood with Rutland ahead 27-21. TJ Moran took home “Man-of-the-Match” honors.